A huge project has recently been completed to deliver a new train depot at Old Oak Common for the Elizabeth line in London. Built by Taylor Woodrow, the four-year project saw the redevelopment of railway land at Old Oak Common to provide maintenance, stabling and office accommodation for the new fleet of trains that will eventually run from Reading and Heathrow through to Shenfield and Abbey Wood. As part of this development, Gradus’ carpet tiles and barrier matting were specified to provide a hardwearing yet aesthetically pleasing solution for the high traffic flooring needs within the offices. Cityscene carpet tiles were chosen in complementary Basalt and Granite shades. 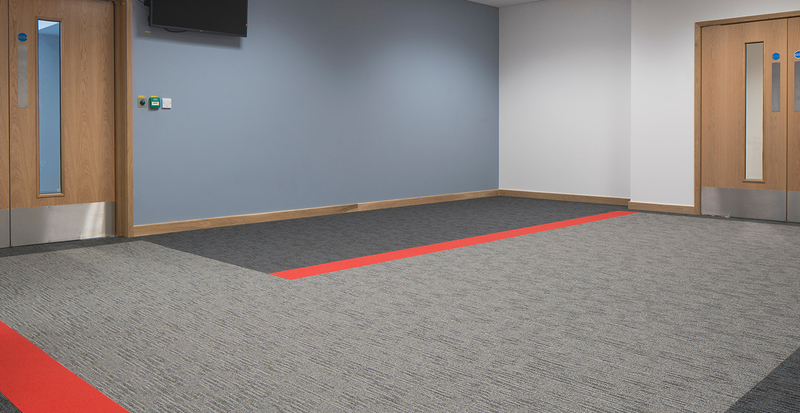 Emphasis carpet tiles in a contrasting red colour create a bold and interesting pattern, whilst also helping people to navigate the corridors. The facility includes a main depot building and nine maintenance roads. Transport for London (TfL) and Bombardier have begun operations at the new Elizabeth line depot with more trains being delivered ahead of the Elizabeth line opening in autumn 2019. For further information on Gradus’ full range of carpet tiles and barrier matting, please contact Gradus Technical Support on 01625 428922 or visit www.gradus.com.